So I am declaring this Saturday Rust Saturday. That is to say, the only MP game that will be played on Insomnia's Discord this particular Saturday will be Rust. If this sounds heavy-handed, I nevertheless feel it's necessary to stops us from becoming like those people and groups who spend all their time playing one or two games. If we ever become like that, I will disband the clan. So, though I am by no means forcing anyone to play anything they don't want to play, I will employ all the means available to me to gently nudge the group in the direction I want it to go. We've been mostly playing PlanetSide, Siege and PUBG since we started the standing MP timeslot, and these are all straight-up shoot-shoot games, so we really do need to play something different once in a while to diversify, as much as to avoid getting bored as to attract players who prefer other types of games. We've collectively put hundreds of hours into these three games, and we also play the latter two of them on a weekly basis, so I don't think it's a huge sacrifice to take a break from them for one Saturday to try something new and different. Rust is purported to be the proper game version of Minecraft, so it sounds exciting, and it only costs ten bucks on G2A, so even if it's not that great we will have got our values for our monies out of it after an evening with it, but I am hoping it will become our new PlanetSide, because I think it can accommodate any number of players. 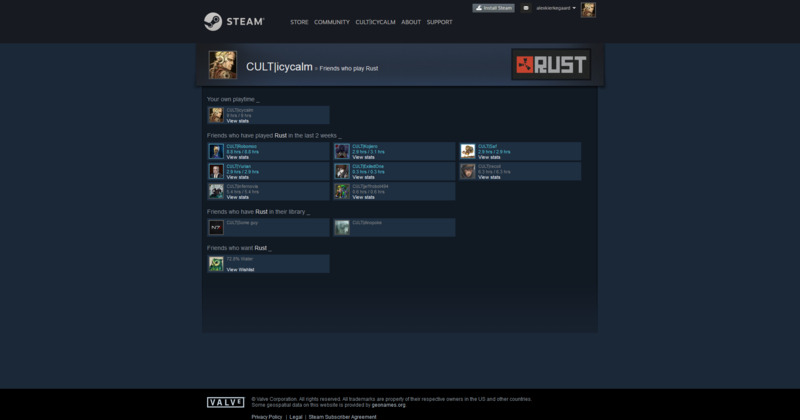 So, if you feel like playing something else than Rust on Saturday, by all means play that. Don't hide from Discord like some people do. I know people have moods, and you may just not be in the mood for that type of game on Saturday. Or maybe you just can't afford a new game purchase right now, or you want to wait it out and see if the rest of us like the game enough to make it a regular thing. Whatever the reason, it's all cool. All I am saying is that around once a month or so I will be picking a new game for us to try, and on that day no other MP game will be allowed on the Insomnia server to encourage people to try out new stuff. So if at least one more person shows with Rust on Saturday, we play that. If not, I'll play something single-player. I hope this hasn't bummed anyone out, but like I said, you can play Siege and PUBG any day of the week with people (or alone on Saturday, for that matter, or if you have that much of an itch to play them you can make a new Discord server and invite people over -- it just takes a minute), but I think that in the long run you will recognize that this is a good policy that will lead us to trying out many new games and having many cool moments and keep our sessions exciting and fresh. If you have suggestions or objections, post them here and we'll discuss them. I think we did pretty well, all things considered. We had no idea how anything worked, and we figured it all out without any outside help. I'd say we made it 50% through the game, before we got crushed. We figured out a way to meet up, established a base and respawn location, and even got hold of a shotgun at one point. 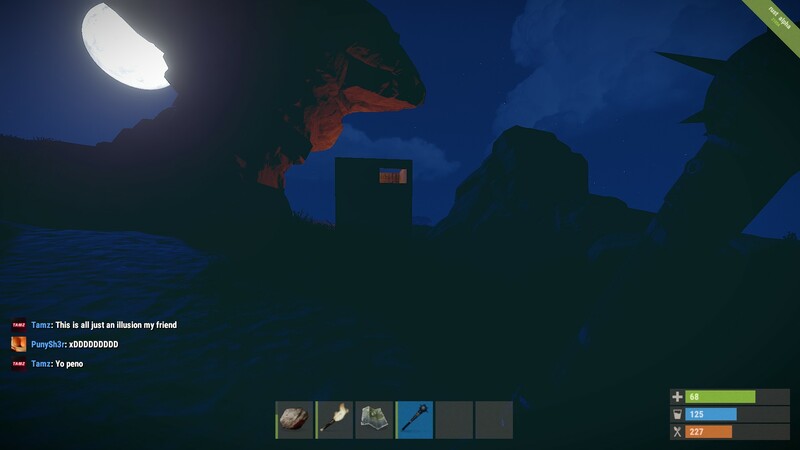 If I had used it to properly guard us, instead of messing about in my inventory and failing to fight back when we got raided, we'd probably have gotten much further in the game that day. Next time I will start proper patrolling the moment I get some type of gun, instead of just sitting in the base waiting to be attacked. I will consider the game beaten if we manage to reach the top of the building tree, kill a bunch of dudes and destroy the settlements in our immediate vicinity, and quit not because we got crushed but because we feel we've done everything we could do in the game and just got bored with it. I think five players are enough to achieve these goals, but a couple more would make things faster and easier. It's basically a tutorial for Ark, the way I see the game now. We played with five players today, three of whom were new to the game (Yurian, Saf and Kojiero), and one of whom was new to the clan (Kojiero). Right at the end Exiled joined us, but everyone was tired by then so we stopped before seeing what 6-player Rust is like (last week's game was also 5-player). So right now ten people have this game in all. So next Saturday will be devoted to Rust again, and the one after that, and the one after, until we manage to get 7-8 people on at least, and get to the end of this game. I strongly urge more people to buy it by then, and join us. I am thinking of declaring this weekend Rust weekend to see how far we can get into the game with max numbers -- i.e. no other MP game will be allowed: no Divinity, no Siege, etc. I will log on at 5PM UTC and start making a base, and play every waking hour throughout the weekend, and people can drop in and out to help whenever they can. Let me know if anyone has a problem with this. Clan Wars is at 10PM next Saturday, so I say we play Uberust from 5PM to 9PM (or even from 3PM to 9PM if enough people can make it). Should be able to finish at least one game, if not two. I am going to put up a new subforum soon so we can discuss things. There have been many cool additions to the game since we last played that I'd love to check out. And now that we have all those guests in the Discord, we might be able to get a few of them to join us for a round. Hell, I bet I could get an entire clan to play against us. BSE, or BRN perhaps. All I have to do is convince the leaders.